Leading the latest Zola Tour was a grand experience that gave Jane and me the opportunity to witness “aha” moments in the lives of our passengers, like-minded Believers (“Believers” is short for “believers in Yeshua/Jesus as Messiah”). As our group traversed Israel from the far northern border in Dan to the southernmost border in Eilat, I couldn’t help but personally note the high places. We visited Mount Carmel where Elijah challenged the prophets of Ba’al. Our pilgrims could see the Gilboa mountain range from Megiddo, and, at a distance, Mount Tabor, where some believe Yeshua ascended to the Father. We traveled up the Golan Heights from where we could view Mount Hermon, whose snowmelts in the spring fill the tributaries to the Jordan River. As our group approached Jerusalem, I thought of Abraham from Ur, who brought his son Isaac to be sacrificed on Mount Moriah — the eventual location of Solomon’s Temple. When we traveled to Eilat via the Dead Sea, we looked eastward and saw the mountains of Moab and Edom in Jordan. My main pause to reflect came in the Golan on Mount Bental, a stronghold of army bunkers from the 1967 and 1973 wars that overlook a valley and the border with Syria. The abandoned city of Quneitra lies in the valley, once controlled by Israel, then Syria, and now in a buffer zone between both countries. I found it amusing that the UN keeps a lookout over Syria from Mount Bental — within the safe borders of Israel. Political fingers always point at Israel and call the Jews the troublemakers in the Middle East. However, when safety is the issue, the political forces choose Israel as a safe haven. Remarkable, don’t you think? While on Mount Bental, I thought about our safe haven — Yeshua — and recalled Psalm 91. I invite you to join me there in the Scriptures and allow the protective presence of Yahweh to cover you with His “pinions,” which we will discuss shortly. It is not only Israel under attack by the great deceiver Satan, but everyone who believes that Yeshua is the Messiah and places faith in Him for a secure eternity! He who dwells in the secret place of the Most High shall abide under the shadow of the Almighty. I will say of the Lord, “He is my refuge and my fortress; My God, in Him I will trust.” Surely He shall deliver you from the snare of the fowler and from the perilous pestilence. He shall cover you with His feathers (pinions), and under His wings you shall take refuge; His truth shall be your shield and buckler. Could it get any clearer that dwelling in His protective shadow is a good thing? Do you remember David’s words in Psalm 23:4? “Yea, though I walk through the valley of the shadow of death, I will fear no evil.” We do not walk in the valley of death but in the shadows in the valley, led by the protective hand of our Lord. You and I are each special to our Lord — never forget it! The next couple of verses tell us to not be afraid. Satan’s best, most effective “dart” is fear. Well, I’m here to tell you that you can tell Satan to “Go to Hell.” Satan knows his destiny. If he can manipulate Believers by fear, then he can create doubt and despair. You are in Yeshua’s hands, and no one can pull you away! A thousand may fall at your side, and ten thousand at your right hand; but it shall not come near you. Only with your eyes shall you look, and see the reward of the wicked. Because you have made the Lord, who is my refuge, even the Most High, your dwelling place, no evil shall befall you, nor shall any plague come near your dwelling. Reminders of the presence of God exist everywhere in Israel. Every pilgrim has a unique inspirational story to tell. Please consider going along with David, Kirsten, Jane, and me to Israel in March 2018 — a truly special year as Israel celebrates 70 years as a regathered nation. P.S. Are you one who dwells in the presence of the Almighty? Are you aware that you are under His “pinions?” If not, the time of decision is moving quickly. Don’t delay your decision to come under His protective, redeeming love. P.P.S. While in Israel, our camera crew shot footage for a new eight-part television series on Isaiah, with teaching by Marty Waldman, leader of North Dallas’s Baruch HaShem Messianic Jewish congregation. Please pray for God’s guidance and provision as we move into production. In December, we conclude our revisit of Esther: For Such a Time as This, one of the Jewish people’s favorite Bible stories. 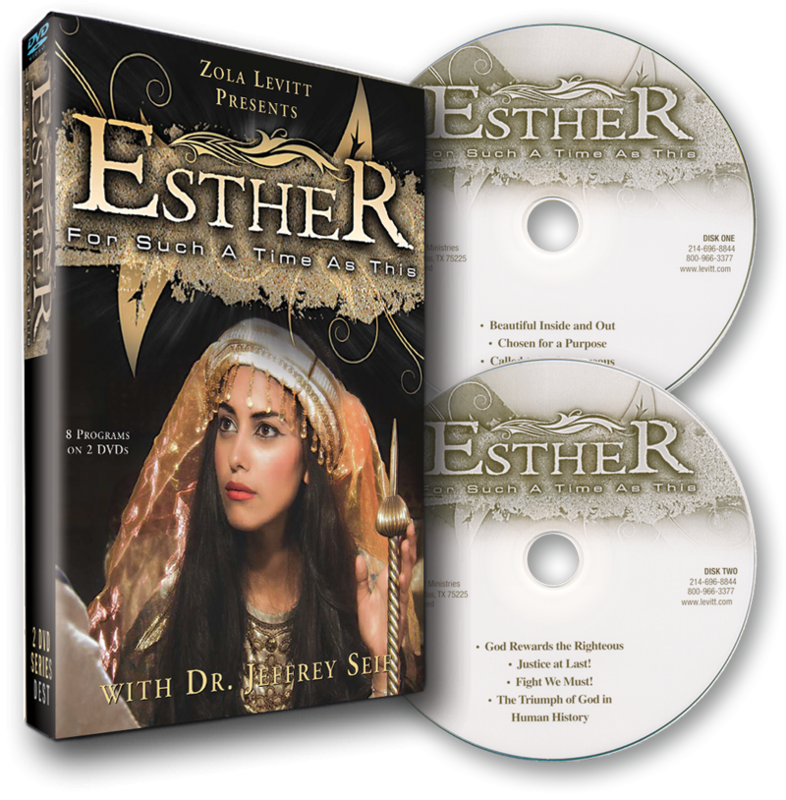 In this eight-program television series, Dr. Jeffrey Seif explains that, like Esther herself, we Believers may be alive for such a time as this. Faced with a plot to destroy the Jews, Esther wavers but declares, “If I perish, I perish!” If only we all had such resolve! The once-sheepish Esther becomes a shepherdess. She boldly takes on the wolf, thus guiding the saga to its peaceful conclusion. God uses irony to give the wicked and the righteous their just deserts, and we see the eventual triumph of the righteous — then as now. Our story’s villain comes to his inglorious end as he becomes the object of his own wicked scheme. The triumph of righteousness and faith encourages us in our own lives. We break our Esther series for our traditional year-end programs that review the past year and offer previews of the new. This has been an exciting year for Zola Levitt Presents. Following last month’s Fall Tour, we filmed our “Year In Review” program from the Mount of Olives, reviewing all the series we brought you in 2017 with a sneak peek at what’s coming in 2018. God is moving, opening new doors to His salvation, and we are thankful to be a part of this fresh season. Please stay with us financially, as we depend on your backing. Because of your faithful, regular giving, people worldwide (literally) are learning about prophecy that is being fulfilled right now in Israel. And they are connecting the Jewish roots of Christianity to their own faith. even better, we can save a whole row for you and your family. What a legacy to give your family a trip to God’s special land, especially during 2018 as the State of Israel celebrates its 70th re-birthday. P.S. By upholding this ministry, you truly are making a difference around the world, and we thank you from the bottom of our hearts! I believe that the God of Israel is keeping watch over His Chosen People and also over us Believers around the world who are grafted-in. Here is my December contribution. Please use it to teach the Church about its Jewish roots and Jews about their Messiah, especially using Isaiah’s gospel. Zola’s Ultimate Hebrew Primer teaches both print and script, so you will be ready to read, speak, and write Hebrew in Israel and in Heaven. Assumes no prior knowledge and progresses gradually, so even the fainthearted will find immediate value. A solid sterling silver rendition of a classic Messianic symbol that combines the menorah, Star of David, and the Christian fish.